Afghanistan - scene of tribal colonial and Cold War conflict across the ages. Into this cockpit dropped a multinational post-9/11 coalition to root out al-Qaeda and replace the hardline Islamist Taliban regime that harboured it. A quick Invasion and regime change portended quiet reconstruction and good governance, but it was not to be so. In their Pakistan sanctuary, the Taliban rebuilt for an insurgency that would ensnare the Coaliton in a tangle of Afghan rivalries, shifting allegiances, and warlordism that the West had only distantly grasped. A Distant Plain takes 1-4 players into the Afghan conflict of today's headlines. This volume in the COIN Series teams two top designers of boardgames on modern irregular warfare: Volko Ruhnke, award-winning designer of Labyrinth: The War on Terror, 2001-? and Brian Train, an experienced designer of irregular warfare simulation games. 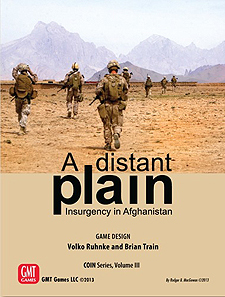 A Distant Plain features the same accessible game system as GMT Games' Andean Abyss but with new factions, capabilities, events, and objectives. For the first time in the Series, two counterinsurgent (COIN) factions must reconcile competing visions of stability to coordinate a campaign against dangerous insurgents. Terror, drug trafficking and eradication, highway extortion and sabotage, drone strikes, and many more options are on the menu. The game runs leftover factions, so that any number of players - from 4 to solitaire - can experience the internecine brawl that is today's Afghanistan. Have a good tour.